DERRY GAA: Brilliant Slaughtneil into Ulster final No. 3! What an achievement by a remarkable club! Slaughtneil senior footballers made it Ulster final No. 3 for the club in 2016 when they emulated their hurling and camogie counterparts by reaching the provincial decider. There they will meeting Down champions, Kilcoo, who enjoyed a routine 4-13 to 0-12 victory over Armagh’s Maghery at Pairc Eisler, Newry. Slaughtneil’s margin of victory may not have been as emphatic as that of the Down champions but their performance was every bit as impressive at the Athletic Grounds, Armagh. Playing into a first half breeze Paul Bradley converted four frees for the Emmet’s who edged the opening 30 minutes by 0-6 to 0-4, Shane McGuigan and Christopher ‘Sammy’ Bradley the other Slaughtneil scorers. Francis McEldowney had gone close with a first half goal chance for Mickey Moran’s men but they eventually found the net early in the second half through Meehaul McGrath. It was a match winning score which put the emmet’s 1-06 to 0-04 up and owed much to some superb work from Sé McGuigan. 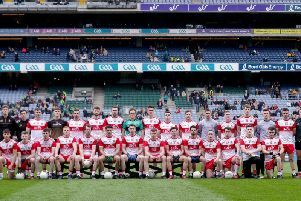 Danger man Mark Bradley was on target twice for the Tyrone men in he opening half but once the Derry champions had their goal, there looked only one winner. Se McGuigan and Padraig Cassidy added points as Slaughtneil controlled the remainder of the game to move one step closer to a historic Ulster ‘treble’.